Selenium is a powerful and popular tool which can be used to test your Smart GWT applications. Selenium executes tests against your running application in a browser emulating user interaction and asserting various conditions. Selenium provides a record/playback tool for authoring tests without learning a test scripting language - we refer to these as Selenium scripts or Selenese. You must be familiar with Selenium and use of Selenium IDE before proceeding. Refer to the documentation on the Selenium site. Selenium supports the concept of Locators in order to specify the element you'd like a given Selenium command to target. For example Selenium supports XPath based locators and DOM ID based locators. XPath based locators are extremely fragile due to complexity of certain highly nested DOM elements you need access to combined with the fact that XPath support varies across browsers and so your tests might not work across different browsers. Use of Selenium with Smart GWT applications is no different than using Selenium to write and run test cases with any other application with the exception of one caveat: Smart GWT occasionally renders a different DOM structure depending on the browser for performance or rendering the UI such that it appears identical across various browsers. As a result using DOM ID or DOM XPath based locators with Smart GWT applications is not advisable. Instead Smart GWT supports a new Selenium locator which is an XPath-like string used by Selenium to robustly identify DOM elements within a Smart GWT application. Smart GWT locators for Selenium are prefixed by "scLocator=" and have a readable XPath-like value even for cells in ListGrid's or TreeGrids. Typically these locators will not be hand-written and are generated by Selenium IDE, Selenium's test recording tool. One primary locator is based on the ID of the Smart GWT widget and has the syntax ID=<Canvas ID>. This simplifies the task of writing tests if you know the ID of the Canvas. For reference, the scLocator syntax for ListGrid cells and DynamicForm FormItems can be found at the end of this document. You can automate the process of running Selenium tests and saving or reporting results using TestRunner. Confirm that the Selenium IDE has been installed. Copy the user extension files listed above to a common location on your test client machine. Open the Selenium IDE and click the Options ==> Options... menu item. On the General tab enter the path to these extension files in the corresponding fields: Selenium Core extensions and Selenium IDE extensions. Refer to the Selenium Documention on user extensions for more information. Go to the WebDriver tab and ensure that the "Enable WebDriver Playback" checkbox is unchecked. Close and restart Selenium IDE to load the new extensions. That's it, we're done configuring the environment. Note: Tests recorded using Selenium IDE can be played back programmatically (e.g. 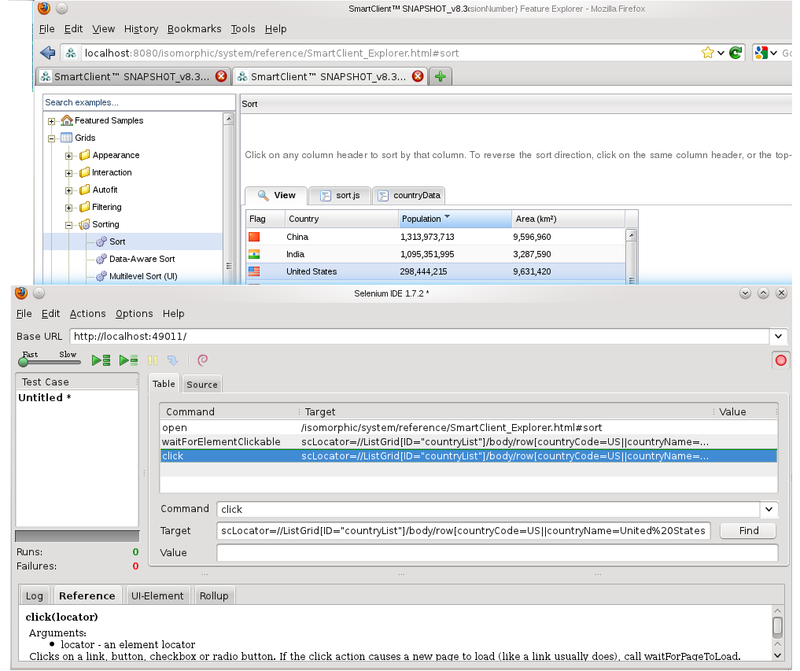 from a test harness) using SeleneseRunner, a simulation tool that executes Selenese against Smart GWT's WebDriver wrappers. This is required because Selenium 3 no longer supports executing Selenese using custom user extensions, as it no longer contains much of the Selenium RC code base. Once you have your application running in Firefox, open Selenium IDE from the Tools ==> Selenium IDE menu option. If the Selenium IDE is in record mode, then clicking or carrying out other operations like typing in a text field with automatically record the appropriate Selenium commands with the Smart GWT locator. In most cases there's no need for you to manually enter the locator, the recorder does this for you! In fact, not only do the provided user extension files record your clicks, drag operations, and typing in the browser--they also try to ensure that your script executes each operation only when the Smart GWT widgets it depends upon exist and are ready to be interacted with. This ensures that when the test script is executed, then even if one or more triggered operations are asynchronous (delayed), it behaves as expected. Sometimes users may also want finer grain control of what Selenium command is created instead of having the Selenium IDE recorder do this automatically. For example if you want to verify the value of a particular cell in a ListGrid. 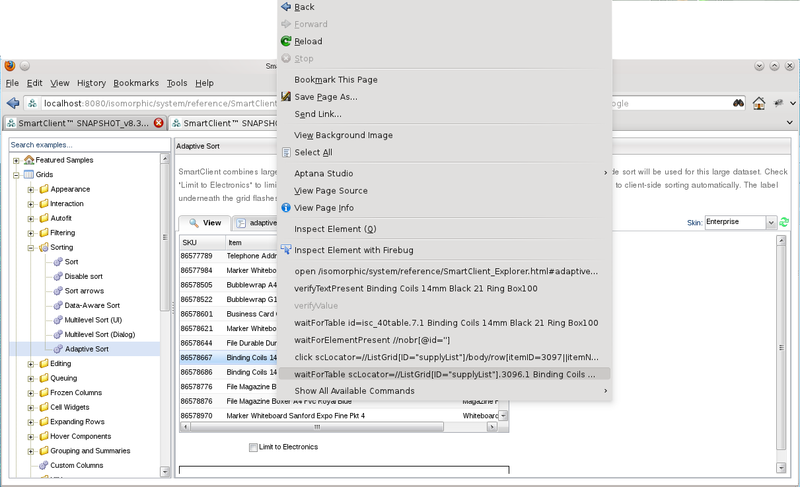 Instead of typing in the command "verifyTable" and manually enter the Smart GWT Locator (scLocator), you can simply right click on the table cell or any other Smart GWT widget and the most suitable Selenium commands will appear in the context menu along with the scLocator path for the clicked element. See image below. Fundamentally, the reason we add waitForElementClickable() calls before each click is to deal with asynchronous Smart GWT operations. Many operations on widgets or the network are asynchronous, and a correctly coded test should wait for such operations to complete as opposed to inserting an arbitrary delay or using Selenium's setSpeed() function. Using such delays runs the risk of the test failing if replay occurs on a loaded machine or slow network, and also makes the test run slower than needed. There are cases where waitForElementClickable()/waitForElementNotPresent() will not work--for example if you're performing a sort that's rearranging existing elements on the screen, or if you're performing a filter operation where you're not sure of the results and thus cannot use the approach from the previous section. In such a situation, you may need to add a waitForGridDone() command into your script to ensure the pending operations are complete before you hit the next command. the saving of any newly edited rows. Because of the waitForElementClickable commands which are automatically inserted during recording, your scripts will automatically wait for the completion of any network operations that block interactivity (via showPrompt, which is enabled by default). However in some cases you may want to wait for all pending network operations to complete, even if they don't block user interactivity. When the call returns, you'd know that any previously initiated network operations--such as filter/sort operations on DataSources--are complete. Add the Selenium command setImplicitNetworkWait(true) to your selenium script in Selenium IDE. Like other Selenium IDE commands with a single argument, you'll want to use setImplicitNetworkWait() by passing true (or false) in the Target field of the Selenium IDE GUI (right under command). Without any modifications, the default value for isc.AutoTest.implicitNetworkWait of false will prevail. Unmasked text items are handled differently - we don't record individual keystokes, but instead record the complete text as a "type" command when we get a "change" event for the element. This event is normally sent when you exit a text item by clicking elsewhere or tabbing into the next form item. However, in certain situations the event may not be sent - one is when the text item is a managed auto child of another form item (e.g. MultiComboBoxItem). In this case, you can tap Alt (Option on Mac) to manually insert a "type" command with the right value. If you're trying to record interactions with menus or submenus of a ListGrid, the recommended approach is to use a right mouse click (i.e. "context menu" command) interaction to record the opening of the initial menu, rather than clicking on the HeaderMenuButton that's shown on the header buttons. For the submenus, it's recommended to click on the appropriate (parent) menu item to properly record what's needed, even though the child menu is already visible from your mouse movement. If you find yourself often having to add commands manually (other than through the above mechanism), you may be approaching the situation incorrectly. In that case check the forums to see if it's a common problem. Capturing of client and server-side logs can be switched on by providing appropriate options to TestRunner, but a few Selenium commands are provided to provide direct control over logging on a per-script basis. If server logging has been configured as "some," then server logs won't be captured for a given script unless you add the captureServerLogs() Selenium command after the open command; switching the mode to "all" will force server logs to be collected for all Selenium scripts, and no captureServerLogs() command is then required. Note that when entering the above examples into Selenium IDE, you need neither parentheses nor quotes, as everything is considered a string and there are fixed slots for each. For more information on how locators are formed and how to influence them, see the AutoTest class in the Smart GWT JavaDoc. If you manually add /imageLoaded to the end of the locator generated for a Button or Img, then AutoTest.getElement() or AutoTest.getValue() can be used to verify whether the icon (in the case of a Button) or image (for an Img) have been loaded succesfully. If you record a locator to a DrawItem, by default its value will be the title, or the contents for a DrawLabel. However, other attributes, as listed below, can be queried by adding a trailing suffix. (Those appearing as links call the associated getter rather than accessing a property directly.) Note that not all properties listed are available on all DrawItems, and that if multiple values are present, they will be separated by a single space when the Framework passes them to Selenium. Maximize the test browser window to avoid offscreen widgets: Some browsers will not respond to events on widgets that are not visible in the browser pane (scrolled out of view or clipped off). To avoid having to manually add script commands to scroll such widgets into view, it's recommended to use Selenium's windowMaximize() command which will force the browser to occupy the entire screen. Note that currently some browsers will respond to events on offscreen widgets (IE will, Firefox will not) however, web standards are unclear on whether this should be allowed and the behavior may change in the future, so best practice is to maximize for all browsers. Use setID() judiciously to ensure stable locators run-to-run: When setID() is not used to supply a unique component ID, locators will sometimes incorporate automatically generated IDs which have a sequence number (eg isc_Object_355). If your test has unpredictable execution order (for example, two simultaneous network operations take place and either may complete first, and both generate UI components on completion) then these IDs will not be stable from run-to-run. They will likewise not be stable if you test part of an app and then embed it in a larger app and try to use the same script. Use setID() selectively to avoid this problem. Generally, it makes sense to use setID() on all top-level (parentless) widgets - at this point, locators for children that do not have a unique ID will be based on the parent's ID plus a relative path. This relative path will not incorporate auto-generated IDs and will generally continue to work even if the interior layout of the parent is significantly rearranged (such as adding a new intervening container widget). Selenium intermittently fails to generate an scLocator with the "type" command on some FormItems. If this occurs, you can manually enter an scLocator into the target field, or use the drop down to select an alternative locator strategy (such as locating a text input element by name).